Prilla, the newest fairy to arrive in Never Land, is so odd that Never Land itself isn't certain whether to let her into Fairy Haven. 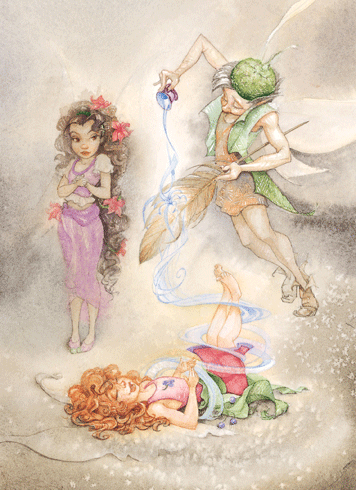 Prilla shakes hands when she meets other fairies, and says "Pleased to meet you," instead of "Fly with you." What's more, she calls Tinker Bell Miss Tinker Bell. Altogether, she acts more like a Clumsy than a self-respecting Never fairy should. To make matters worse, Prilla doesn't know what her talent is—or if she has a talent at all. Mother Dove, the wisest creature in Never Land, thinks Prilla has a talent, but even she isn't certain. A diabolical hurricane, a selfish fairy, Captain Hook, snobby mermaids, a fierce golden hawk, and the evil dragon Kyto combine in a tantalizing elixir that tests Mother Dove's wisdom, Tink's courage, and Prilla's mettle. Even Clumsy children on the mainland—even readers, wherever they may be—play a crucial role in deciding Never Land's fate. Fairy Dust and the Quest for the Egg is written by Newbery Honor-winning author Gail Carson Levine, master of the modern fairy tale. It is illustrated in stunning detail by David Christiana.